A new analysis shows the Chicago region has grown more car dependent since 1980, and that a different approach is needed to create healthier, more sustainable and more equitable communities. The Active Transportation Alliance’s 2018 Regional Mode Share Report demonstrates the region’s inability to build its way out of traffic congestion. A larger percentage of Chicagoland residents are driving to work today compared to 1980, and the total amount of driving in the region has grown approximately four times faster than the population. While the region’s population grew by 18 percent since 1980, the traffic increased by 66 percent in the same period. View the full report for a breakdown of the data by tranportation mode, county and demographic information. 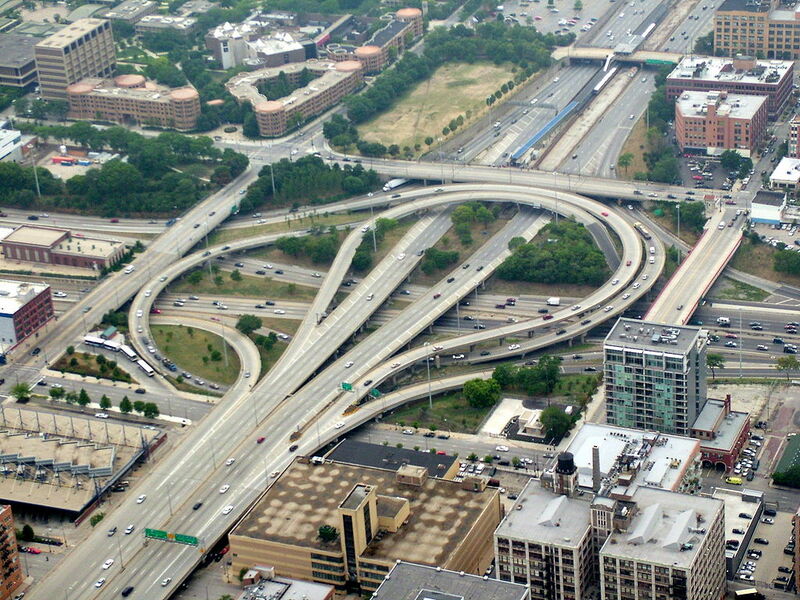 You can also sign a letter in support of a moratorium on expressway expansion in Chicagoland. Between 1996 and 2015, the region spent billions of dollars to add more than 1,000 miles of new roadway that was purported to reduce congestion. This has only led to more driving, more traffic crashes, injuries and fatalities, as well as more air pollution, flooding and chronic disease due to physical inactivity. Roadway expansion also has made it more difficult for people to access jobs and other destinations without a car, worsening economic hardship for low-income residents. For these reasons, Active Trans is calling for a moratorium on expressway expansion in the Chicago region. Tell Governor Rauner you support an expressway expansion moratorium. Research shows that roadway expansion in urban areas only exacerbates traffic congestion in the long run by inducing more driving that over time fills in the additional roadway space, with congestion rebuilding to previous levels. Remove expressway expansion projects from the ON TO 2050 regional plan, Illinois’ Long-Range Transportation Plan and the Tollway’s Move Illinois Capital Program. Adopt a policy acknowledging that expressway expansion leads to induced demand that undermines congestion relief, reinforces car-dependency and disadvantages people who cannot afford or cannot physically drive a car. Prioritize lasting, cost-effective congestion relief with strategies like better public transportation and rush-hour demand management. Take action today if you support this new approach to transportation spending. Active Trans’ Walk and Roll the Vote campaign will highlight these issues by educating voters and candidates in the upcoming 2018 statewide elections and 2019 municipal elections.